Theoni has been teaching moms & babes yoga for over a decade. 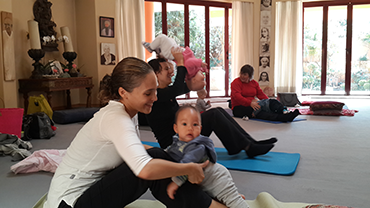 Drawing on all of her experience, she has now developed a new 6 week course that includes all the lovely connection with baby and yoga, as well as new practical tools and resources for moms. Blending together her knowledge and experience of Kundalini yoga, NLP, Mindfulness, Kahuna and Hypnotherapy, Theoni has created this course to enable moms and babes to find their unique style of connecting as mother and child. The course allows for special “us time” for you and your baby. Theoni will show you how to deepen your yoga practice in amidst time with your baby. Being with other moms in the same situation allows you to connect and share with them, including all the ups and downs you are experiencing. It is yoga playtime: learn how to get your baby engaged, relaxed and comfortable with this ‘new’ form of play. Theoni creates an atmosphere of total acceptance and fun and the classes focus on yoga that stretches and strengthens you as a mother to help you find balance in all that you do. This class is for Moms and babies who are 6 weeks old up to babies that are crawling. Connect with baby on the outside. Strength your body and flexibility. Focus on developing strength in your abdomen, back and pelvic floor. Whether you’re exploring your new role as mother, or even if you’re welcoming your second third or fourth baby, the course will bring new insights and learning, as each group brings its own dynamic. Below are the topics we will be covering on the course. Class 1. Gets you back in touch with your body, and touches on the joys and challenges of new motherhood. Class 2. Has you learn about re-connecting with yourself to be the best mother you can be. Class 3. Explores further what kind of mother you want to be and how you can find your unique style. Class 4. Focuses on self-care and feeding baby. Class 5. Considers how motherhood has impacted your various relationships. Class 6. Explores different parenting styles to help you choose your particular way forward. What to bring: Yourself, a pillow and blanket, and a mat if you have one, and, of course, all baby’s "stuff”. Cost: R900 for mom and baby for six weeks, paid in advance (non-attendance cannot be made up or compensated). SPACE IS LIMITED TO 8 moms & babes ONLY, SO BOOK NOW TO SECURE YOUR SPOT!